Whariti Meats is at the cutting edge of "Home Kill" technology. For the serious animal owner who requires a professional service provider. We are committed to excellence, quality product, service and value for money. 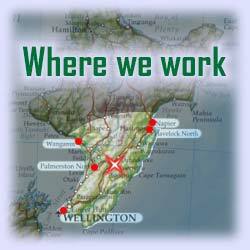 Whariti Meats operates throughout a large area of the lower North Island, predominantly Hawkes Bay, Wairarapa & Manawatu, but with our new slaughtering methods we can receive stock from much further afeild and present quality product back to the animal owner.